Dimensions Toolkit schools get great new products and resources added to their download area automatically. Check yours for your PSHE Assemblies (added July 2016). 30 whole-school assemblies with 10 catchy songs. Dimensions Toolkit schools can buy a discounted hard copy for just £100 (+VAT & P&P) – saving £75! We really appreciate it when you spread the word about the impact our exciting curriculum has had on engaging your children, as well as freeing up your time. 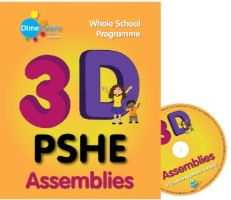 If a new school buys our Toolkit based on your recommendation, we’ll send you a free hard copy of our 3D PSHE Assemblies. Tell them to mention us when they enquire with us. That way, we’ll know it came from you!